If you want your car to perform well and be safe for driving, you need to acquire the right tire size. The tire that you select should reflect the conditions in which you drive and your preferences for car response and handling. It is good to know the ideal tire size for your car in order to be in a position to make the correct decision when it comes to purchasing tires. All you have to do is to understand how to read tire size. This is very simple as all the data that you need is in the owner’s manual or inside the car. When reading tire size, you may come across numbers that reflect the tire size, temperature, type and performance. It also helps to understand the alignment of the car. In addition, you will come across speed, maximum inflation pressure and load. Below is a guide on how you can interpret the figures and letters on your tire so that you can choose a tire size that suits your driving demands. When you see a letter P at the start of the tire size, this refers to a tire meant for passenger vehicles which is a standard used in the US. And if it comes with no letters at the start of the tire reading, this means that it’s a Euro metric tire. Also, another set of letters which is LT means that the tires were created for light trucks. This is the width of the tire measured in millimeters from one sidewall to another. Actually, the first three-digit number in the tire size refers to the tire width. For example, in a size of P215/65 R15, the width is 215 millimeters. This is the ratio of the height of the tire’s cross-section to its width. The two-digit number after the slash mark in a tire size is the aspect ratio. For instance, in a size P215/65 R15, the 65 implies that the height is equivalent to 65% of the tire’s width. The bigger the aspect ratio, the bigger the tire sidewall will be. The letter R in a tire size represents the radial, which implies that the layers run radially across the tire. Other letters usually used for radial construction are D or B. they normally follow the two-digit aspect ratio. More than 98% of all tires sold today are radial tires, where the internal body plies of the tire radiate outward from the center. This is the size of the wheel measured from one end to another. It shows us the size of the wheel that the tire is intended to fit. A size P215/65 R15 tire is created for a wheel with a 15 inch diameter. This shows the maximum load that the tire can support when well inflated. Also, you will be able to view the maximum load on the tire sidewall, this is both in pounds and kilograms. This feature of the tire shows you the maximum speed capability of a tire. Usually, speed ratings are matched to the top speed capability of the car. For instance, a tire with an H-speed rating has a maximum speed ability of 130 mph or 210 km/h. 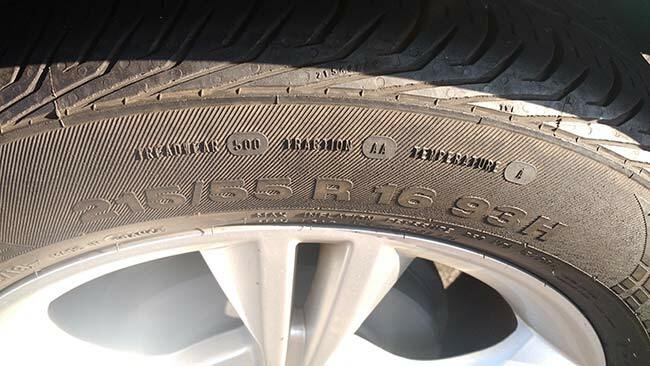 When you see a tire with the DOT letters on its sidewall, this means that tire is compliant with all applicable Federal Motor Vehicle Safety Standards in the United States. The TIN number follows the DOT letters. It is made up of 12 numbers and letters that identify the factory base and week and year the tire was created. This is the standard for Uniform Tire Quality Grading, which is a system created by the U.S department of Transportation to offer users with the data to assist them buy tires based on their relative treadwear, traction and temperature capabilities. For instance, the highest traction grading is of a tire with AA and can perform exemplary in wet conditions. Temperature grades show the ability of a tire to withstand and dissipate destructive heat. Finally, treadwear grades are based on standardized government tests to assist predict the expected treadwear of a tire. With the above guideline on how to read tire size, you can now go ahead and choose the correct tire for your driving needs. The right tire size ensures that you drive safely and well.